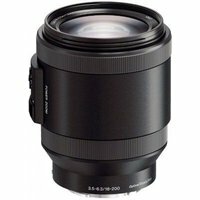 The Sony 18-200mm f3.5-6.3 OSS Lens is Sony's latest, more advanced 18-200mm lens for the serious Sony E-mount APS-C compact system users. The solid, sleek black finish with aluminium construction is tough and light enough for any shoot and is perfect for outdoor use. The 11x telephoto zoom range is ideal for shooting wildlife and other subjects at a distance, as well as landscapes, travel, architecture and group shots. The built-in power zoom lever on the lens barrel provides smooth video zoom control for steady close-ups and sleek, professional looking movies. Optical SteadyShot (OSS) ensures shaky footage is a thing of the past, when capturing both stills and movies handheld. Quick and accurate autofocus ensures your photos are sharp, crisp and full of detail. Adjust the circular aperture for softer natural defocusing and make foreground objects stand out against a blurred background.